University of Pittsburgh Press, 9780822964513, 72pp. Joan Naviyuk Kane is the author of The Cormorant Hunter’s Wife, Hyperboreal, and The Straits. Her awards include the Whiting Writer’s Award, the Donald Hall Prize in Poetry, the American Book Award, the Alaska Literary Award, and fellowships from the Rasmuson Foundation, the Native Arts and Cultures Foundation, and the School for Advanced Research. Kane is a faculty mentor in the MFA program at the Institute of American Indian Arts in Santa Fe, New Mexico. She is Inupiaq, with family from King Island and Mary’s Igloo, and lives in Anchorage, Alaska. "Her latest book of poetry contains themes of motherhood and the relationships between land and peoples, and ever present is her unmatched mastery of form and language. . . . 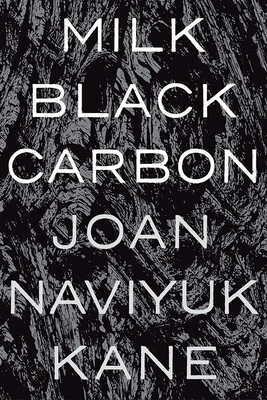 Unique to Milk Black Carbon is the palpable sense of urgency throughout the poems."